Casa Mareceu is a stylish and well-furnished 3 bedroom, 3 bathroom villa with a beautiful 9m by 4m swimming pool. 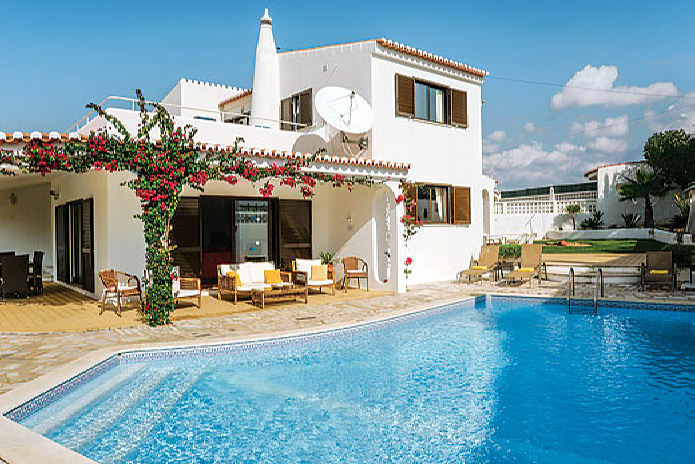 The villa is ideally located just off the coast road near the village church and boardwalk and only 0.3km to Carvoeiro village square which links directly to the beach. The villa has its own gated private parking area which is suitable for 2 or 3 cars and the plot is completely fenced and gated. The property offers excellent communal and private areas with great sea views enabling clients to watch the world sail past or to take time by ones self on one of several private terraces. 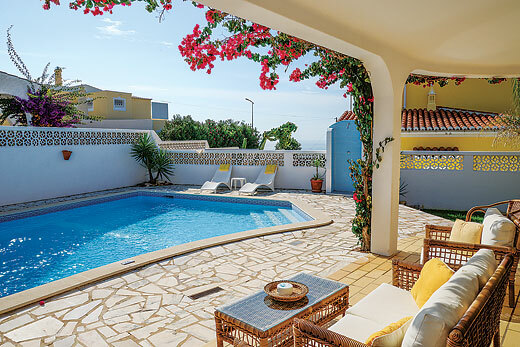 On entering the villa you have a reception area: to the right are 2 steps down to a beautifully furnished lounge, with lovely traditional Portuguese terracotta floor tiling, seating for at least 6, centred around the flat screen TV and media centre. There is Wi-Fi for clients to keep in contact with friends and family as well as watch TV online if desired. The lounge has two sets of patio doors that open onto covered terraces: one with a table and chairs for meals and the other with lounging furniture. From the lounge, 2 steps lead you to a separate dining area with seating for at least 6 and a door to the kitchen for ease of service when eating in. The kitchen can also be accessed from a corridor leading from the reception area and is fully equipped with oven, hob, microwave, dishwasher, coffee machine, kettle, toaster etc. Clients have access to a separate laundry area with washing machine and door leading to terraces and back lawn area. From the reception area a corridor leads to the two downstairs twin bedrooms. 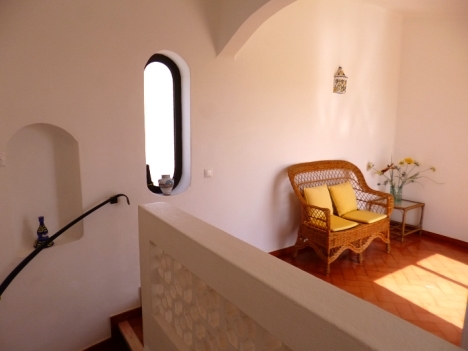 The bedroom to the left is well furnished and has a window with views to the sea and garden. Opposite the bedroom is a family sized bathroom with shower over bath, basin, toilet and bidet. The second twin bedroom has patio doors to a small terrace, again with sea view, with table and chairs and steps down to lawn area - perfect for your morning coffee or tea as you plan the day ahead. This bedroom has an en-suite shower room with shower, toilet, bidet and basin. The staircase from the reception area leads to the first floor and the master bedroom. At the top of the stairs is a small seating area, ideal for reading while out of the heat of the day but still enjoying the sun. A patio door leads to a large sun terrace with sunbeds and table and chairs, where you can enjoy the beautiful sea views and late evening sun sets. The master bedroom is well furnished with large double bed and quality furniture and has an en- suite shower room with shower, toilet, bidet and basin. 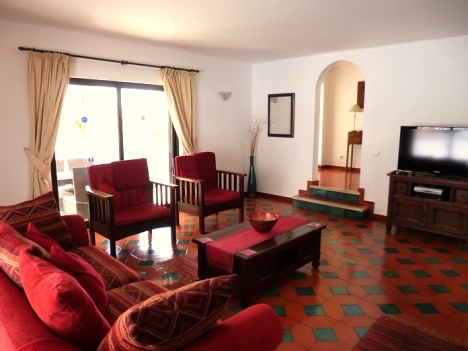 The property has air conditioning available in all the bedrooms and the main living areas. There is a safe and the owners supply hair dryers and beach/pool towels for clients use. Outside there is a 9m by 4m swimming pool which opens up to 5m wide at one end and has Roman steps with a depth starting at 1m sloping down to 1.6m and then 2m at the deep end - just great for family pool games. On the sun terraces near the pool are sun beds and parasols and then a large raised terrace with built in BBQ and further outdoor eating facilities including table and chairs. The property has mature gardens with lawn areas and flower borders to both the front and rear of the property. On leaving the villa, you can either go left to the Algar Seco with its rock formations and the restaurants and bars to the top of Carvoeiro, or go right to the boardwalk entrance, village church and short walk to the village square and beach. At Mareceu there will be no need to hire a car as you will be close to everything that Carvoeiro offers: a large number of quality, good value restaurants, bars and shops as well as the lovely beaches. In the high season (June-September) there is also live entertainment in the village square. However if you wish to explore the Algarve further then we can assist in hiring a car or arrange airport transfers as required.